These squeegees are manufactured to Blick's specifications. Kiln-dried and precision cut lumber is used for the no-warp handles, which are smooth, comfortably shaped, and easy to handle. Blades are molded under high heat and pressure and have a tensile strength of more than 2,000 lbs. This eliminates ink streaking and provides a superior long-lasting printing edge. They have excellent abrasion and solvent resistance. 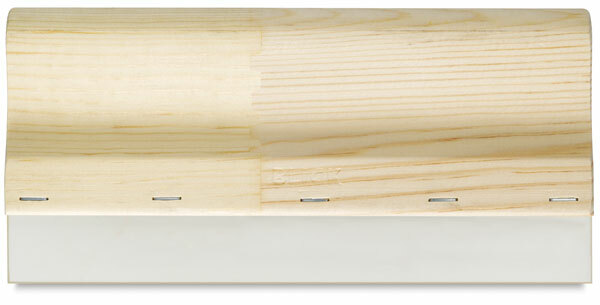 Squeegee blades are inserted into the wooden handle and stapled in position, then professionally sharpened after assembly. Use them for both graphic and textile applications, for all hand printing and many machine applications. The square edge blade is the most common blade used in textile and graphic applications, providing good shearing action of the ink through the stencil. It is also an easy blade shape to re-sharpen. Urethane Squeegee — Color coded blade measures 3/8" thick and is 1-7/8" deep. Medium/soft. Use it with a wide range of meshes and ink viscosities on even surfaces with minimum texture. Standard Squeegee — Transparent yellow blade measures 3/8" thick and is 1-7/8" deep. Medium/soft. Use it with a wide range of meshes and ink viscosities on even surfaces with minimum texture.